Well the bottom tens out and mr. Frost is number one and mr. Morris is number 3. Kelly Bryant benched at Clemson just in time to take a RS season and transfer to another school for his senior season. Think Chad might be interested in him? I still say unless he is a grad transfer he has to sit a season (or go FCS). You cannot take you year sit out at another school. Somebody please correct me if I am wrong. mrydel wrote: I still say unless he is a grad transfer he has to sit a season (or go FCS). You cannot take you year sit out at another school. Somebody please correct me if I am wrong. He is a senior so Im assuming he would be a grad transfer. Even if he isn't technically a senior he can pull a Garrett Gilbert and make up the classes he needs in a spring and summer. On the one hand, I can totally see him going to Arkansas due to what I would assume is a relationship with Chad, but not only is Arkansas is losing quite a bit this year from it's current offensive weapons they are going to have two returning QB's - he's going to want an almost surefire place to play. My guess is LSU picks up ANOTHER QB transfer. I agree. I just hear a lot of people here (not Ponyfans) saying they can take the redshirt after 4 games and go anywhere without sitting out and that just is not true. One of the QBs will likely be asked to transfer and 99% chance the other would not beat out Bryant in that system. I think he would just be used as a one-year stopgap to get the younger QBs some seasoning before starting them in the future. Arkansas loses nothing of value after this year. 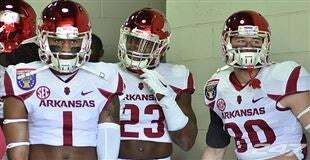 If Bryant was a grad transfer and went to Arkansas today he would start on Saturday. I doubt little Jerry Jones will beat him out. If you play in 4 games or less, you can red shirt and transfer, but, you still have to sit out a year. What you gain is the extra year of eligibility. White Helmet wrote: [quote="mrydel"]I still say unless he is a grad transfer he has to sit a season (or go FCS). You cannot take you year sit out at another school. Somebody please correct me if I am wrong. mrydel wrote: Arkansas loses nothing of value after this year. If Bryant was a grad transfer and went to Arkansas today he would start on Saturday. I doubt little Jerry Jones will beat him out. john Stephens Jones will not beat anyone out of playing time. Dude is 5'9. Fine for scrappy HS QB - but SEC west? never. Their top receiver has already announced he’s transferring- we actually ought to call him - and he’s going to lose three linemen to graduation. He’d most likely start, but he would have no help. That “top receiver” has caught one pass for -2 yards this year. I think Arkansas will manage. He is leaving because just the addition of Woods recruited over him. Another we might wanna look at.